Home » cinema reviews • fantasy • text reviews » Is the Prince REALLY on the Throne? 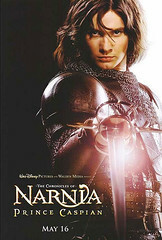 The Chronicles of Narnia: Prince Caspian is the second in the motion picture fantasy franchise created from the books by C.S. Lewis. The story recounts the adventures of the four Pevensie children, Peter, Susan, Edmund, and Lucy, as they re-enter Narnia to help Prince Caspian fight for his rightful place on the throne. In this installment, directed by Andrew Adamson (Shrek) and starring an ensemble cast of newcomers and well-known’s, we see a darker, wilder Narnia, with more action and deeper character development than either the book or the first film. Narnia came on to the latest fantasy film craze a little late and in some ways it shows. Production-wise, the film is fairly good with breathtaking scenery and sets. However, after ten and a half hours of The Lord of the Rings and five Harry Potter movies, the general audience may not appreciate some of the locations (many of which were filmed in New Zealand) and effects. In places the CGI seems overdone and cheap, but on the other hand, the costuming and small sets are done quite well. Giving the Telmarines (revealed to be seafarers that ended up in Narnia through an island cave) a Spanish conquistador air is clever and successfully done, and the high point of costuming is the Telmarine costumes inspired by the unconventional Spanish Renaissance painter El Greco. A conscious effort was made to make the world look Medieval, as while only one year has passed in England since the Pevensie children left Narnia, 1300 years have passed in Narnia since Aslan (voiced by Liam Neeson) broke the stone table, and Narnia has entered into a dark, savage age. What really carries the film is the range of the actors involved. Adamson should be commended for casting the right dwarves. Consciously casting Warwick Davis (Willow) against type was a wise move. Davis is a talented actor, and the opportunity to play a more sinister character gratifyingly expands his range and demonstrates his ability. Davis’ rendition of Nikabrik does not disappoint. 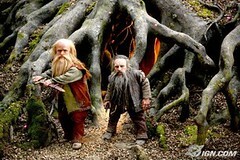 But, it is Peter Dinklage (Living in Oblivion) that steals the show as the grumpy, sarcastic dwarf Trumpkin. Eddie Izzard gives a great voice to Reepicheep making him a bit more sinister and dangerous than his book based counterpart. Ben Barnes excellently creates a weird Inigo Montoya/Antonio Banderas fusion in his rendering of a Spaniard-inspired Prince Caspian. Skandar Keynes handles the character heavy role of Edmund quite well, casting a subtle yet well-developed shadow of maturity over the other Pevensie children. Behind the cast of main characters, a cadre of Hispanic and Italian actors gives great character to the Telmarines. Led by Sergio Castellitto (King Miraz), Pierfrancesco Favino and Damián Alcázar play a great foil to the star-studded line up of main characters. The film also shows how Adamson has grown as a director. In The Lion, the Witch and the Wardrobe, it seemed as if he was still learning about directing real people rather than computer generated ones. While it does not seem like he is on pace to equal the genius of Cuarón’s Harry Potter and the Prisoner of Azkaban, he does seem to be on track to capture the intensity of The Voyage of the Dawn Treader as he learns to take more risks when it comes to content and characterization. Lewis purists will be disappointed that the film deviates from the book in several ways. However, it is this deviation that allows for some of the deeper character development and adds to the interest of the film. The Lion, the Witch and the Wardrobe focused more on the exhibition of Narnia as a setting, and the principle characters in that film were listed in the title; the movie was more about a lion and a witch and the land beyond the wardrobe with the four Pevensie children as the eyes and ears of the audience. 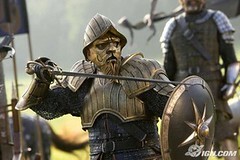 Prince Caspian, however, builds the action around developing the character of the protagonists. The situations that the children find them in are more dangerous and real. The children not only have to brave the dangers of battle and the new politics of Narnia, but they also have interpersonal and internal struggles with faith, trust, love, and maturity. The struggle between faith and unbelief is one of the major underlying themes of the movie. The darker, more savage Narnia illustrates in the world what is going on in the hearts of the Pevensies and the Narnians. In The Lion, the Witch and the Wardrobe, Aslan (clearly defined by his sacrificial death and resurrection as an allegory for Jesus Christ) is very present and active in the events of the story. His immediate presence and visible work in the events of the story make it easy for the children and the Narnians to put their faith in him and trust him. At the outset of Prince Caspian, Lucy (Georgie Henley), the youngest Pevensies, sees Aslan and desires to follow him, but because they cannot see him, the other children are reluctant to follow Lucy. Only Edmund thinks that following Lucy might be a good idea, because last time he didn’t believe Lucy, he ended up making himself a jerk. The Chronicles of Narnia: Prince Caspian shows us that unbelief is not necessarily a matter of acknowledging God’s existence but rather a matter of acknowledging our relationship with Him. All the Pevensies know that Aslan exists. Yet all but Lucy at some point do not believe that Aslan will help them. This is illustrative of how one can believe God exists yet still stray from Him; thinking that He is not working in their life. Prince Caspian accurately reflects the biblical truth that that through opening our hearts in belief, we then see how God is working and will work, even to cure unbelief, as one of the earlier believers says upon seeing his son healed, “I believe; help my unbelief!” (Mark 9:24). There’s No Place Like D’OH!! !